Turn after turn of over-the-head deep powder. 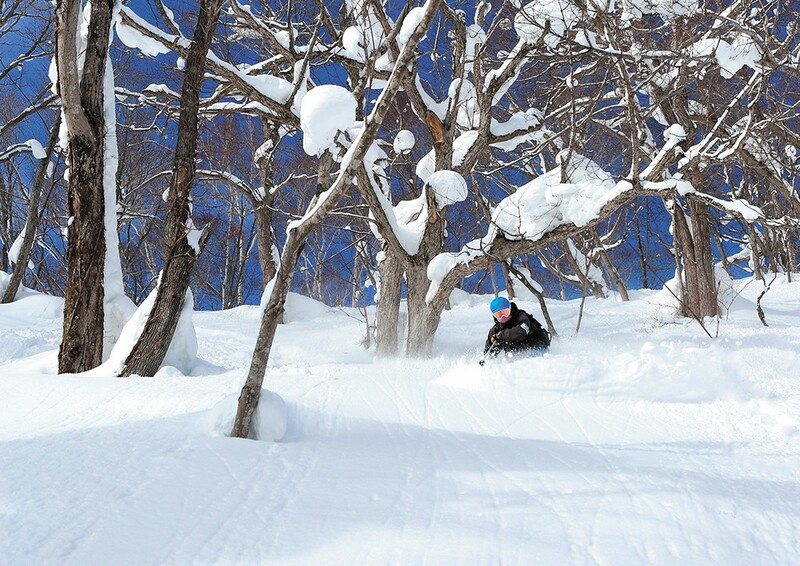 Skiing Japan has been on my bucket list for years. 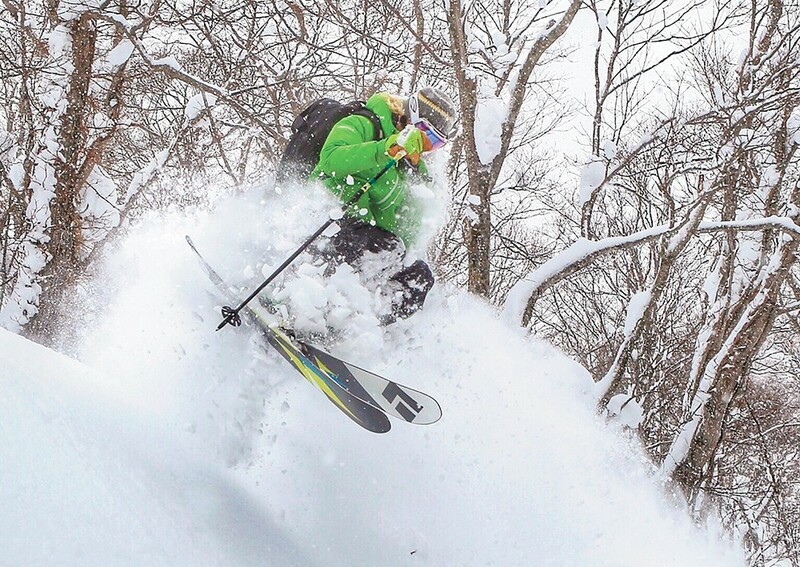 The north island of Hokkaido gets an average of 45 feet of snow a year. So light and fluffy, it beats the pants off Utah's claim of "the greatest snow on Earth." Light snow, people, the culture and of course the many face-shots are what I love about skiing, and Japan was the place. I rallied my wife and two good buddies to head over to the land of the deep. We knew it was going to be a long flight but what we didn't expect is that our actual travel time would last for days. We left on an early flight from Spokane to Seattle, then onto Tokyo with our final flight to Sapporo. After a delay in Tokyo because of weather, we were Sapporo bound. The flight went quick as we were full of smiles and ready to ski. Out the snowy window we could see the lights of Sapporo. Hearing the landing gear deploy, we could hardly contain our excitement. But then, we started to climb. The pilot got on the intercom and in broken English, said, "Well, folks, it appears Sapporo airport is closed due to the large amounts of snow." After arriving back late in Tokyo, the airline booked us a hotel to crash before our rescheduled flight the next morning. With a quick four-hour nap, we were back at the airport, just to sit and wait on the weather again. Half the day went by, then they gave us the green light to depart for the north island. Just as we were about to land, it happened again! The plane pulls up and we are heading back to Tokyo. When we arrived, the nearly empty airport from the night before is now jam-packed with people trying to reach Sapporo. As it turns out, it had been days since a flight had actually landed. I have never seen so many people in one line all waiting to reschedule flights; the whole town of Sandpoint could have been in that line trying to get to Sapporo. There has got to be a better way, we all thought, we're never going to get there waiting in this line! So we started to throw out ideas. My brilliant wife heard a rumor about a train. We had nothing to lose at this point, so we bailed for the Tokyo train station. Navigating the crowded Tokyo subway system with ski bags was an adventure all by itself. They were literally stuffing people into the subway car in order to shut the doors. I've never felt like a sardine in a can before that moment. Somehow we were able to purchase the last few tickets available and we were off on a bullet train flying at over 100 miles an hour through beautiful Japan. After a few really close transfers, trading a bullet train for old wooden seats, and about 14 hours, we woke up to snow white. The whole city of Sapporo was buried in snow with more falling. Finally we grabbed the transport up to the resort town of Nesiko. The falling snowflakes were the size of pingpong balls. On the way, the banks were so high, it was like traveling through a tunnel of snow. When we arrived at the hotel, we downed some coffee and jumped in our ski gear to hit the slopes — after three exhausting days of travel! On the lift at Moiwa Ski Resort, we were all smiles, discussing which run we should take first. We heard the sacred trees were the place to ski. Our first run was perfectly gladed. Turn after turn it was over-the-head deep, basically skiing by braille, hoping to not hit a tree. I couldn't stop laughing! Is this some kind of joke?! On the chairlift ride back up, we could have been an advertisement for your local dentist with our big powder-eating smiles. We forgot all about our crazy travels. The rest of the day it was snowing hard with free refills. That night we met up with my friend Andy of Soul Powder Guide, who was our ski guide for the rest of the week. He and his wife took us to this small famous Japanese restaurant. His wife is from Japan, so she ordered some traditional dishes, along with some questionable ones. From cow tongue to fish pancakes our bellies were full and spirits were high after numerous bottles of sake. The week didn't let up — it just kept on snowing. Every day Andy took us to different ski resort. Moiwa, Niseko Village, Kiroro Snow World, Niseko Annupuri, Kokusai, Rusutsu and night skiing at Grand Hirafu. We skied so much powder it was a blur. The sun did come out for an hour that week when we were skiing in Annunpuri. The original print version of this article was headlined "Worth the Wait"